Flip Out Mama: ABBA You Can Dance House Party!! Review of a great game! 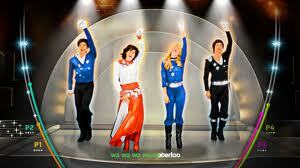 ABBA You Can Dance House Party!! Review of a great game! 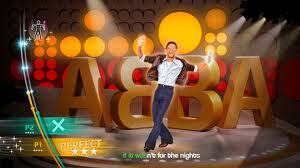 I am really excited to tell you guys about the new ABBA You Can Dance game that just came out! It is from the makers of Just Dance! If you have ever played the Just Dance games, then you know how much fun they are! We recently got the opportunity to host a ABBA You Can Dance House Party!! As you guys know, I have two little boys, but that did not stop us from having an AWESOME 70's disco bash! I was lucky to be blessed with boys that *LOVE* all sorts of music, and especially love video games, so this was right up our alley! We had a few complications that kept our dance party from being as awesome as we had hoped, but we still had a great time! The game itself was so much fun! Bean, of course is really too small to play it, but Tater and I were really into it! The game was really fun, and I really enjoyed hearing some great disco songs! Tater was singing along too, by the end of it! Some of the songs have only one dancer to follow, but I really liked the ones that had the four different dancers, each doing their own move. It was much more fun! I must say that the best part of this game in our opinion, was the karaoke part! All the words pop up on screen and you can sing along! The Timeless Music of ABBA - Enjoy all the hits - 26 in all - from ABBA's rich catalog of classic songs, now digitally remastered for Wii and your home entertainment system. You Can Dance - Unleash your inner dancing queen and play for fun or to set a new top score to challenge yourself and others. Play any way you want with up to four friends. Mini-Musical - Perform a story through the music of ABBA! Experience the magic as you play a role in a mini-musical of ABBA's songs. Karaoke Mode - Up to two additional friends can join in on vocals. Simply follow along with the on-screen lyrics. A Must-Have for Fans - Get immersed in the amazing world of ABBA with authentic content including their music videos, live concert footage, and classic photos! We really enjoyed the ABBA You Can Dance game, and I know we will continue to have a lot of fun playing it in the future! Hopefully soon, I will be feeling well enough to join in on the fun! 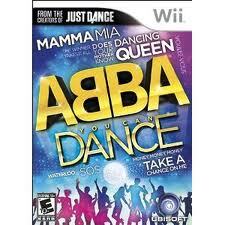 You can purchase ABBA You Can Dance for the Wii on Amazon for only $29.96! New Flip Out Mama Facebook Page! SpongeBob's Frozen Faceoff on DVD Tuesday, Jan 3! Great Computer Accessories from Wintec! In North Texas? Need A Roofer? 8 Deals A Day @ No More Rack! Check Out This New Book For Moms! Stocking Stuffers From Townley Girl! Funny Name, Great Product! FatHeadz Eyewear! Exciting News From Domino's Pizza PLUS #GIVEAWAY! Hot Gift: Wild Dill ! Hot Gift: Blue Sky Scrubs! Hot Gift: Eden Fantasys.. well, anything!! Hot Gift: Blue Box Toys! Ben 10 Action Figures: Great Gifts For Big Guys!